Home / Press / Archive by category "Other Media"
COLLEGE PARK, Md.- The University of Maryland Athletics department took part in Terps Against Hunger third annual homecoming service event at the Xfinity Center on Sunday. Terrapin student-athletes and ICA staff were part of 2,000 volunteers that packaged 275,000 meals throughout the day on Sunday to be donated locally, to support hungry children and families in the DC-Metro area. In addition to ICA staff members, athletes on the gymnastics, softball and track and field teams volunteered their time to assist Terps Against Hunger, each taking a different time shift of 75 minutes. Among those who volunteered their time, SAAC member and senior gymnast Emily Brauckmuller. “Giving back to the community on a day like today really makes us realize how fortunate we are as student-athletes and representatives of this university,” said Brauckmuller. Terps Against Hunger is a student run organization at the University of Maryland that organizes and conducts food-packing events with student groups and community organizations. This past Sunday at the homecoming service event, the organization packed their millionth meal since their founding in 2013. When freshmen arrive at the University of Maryland, Wallace Loh, the president, tells them that only one in a thousand people on the planet have the privilege of a college education — so they should use that opportunity to give back, someday. It’s not an unusual message, but it’s one that the state flagship school is investing in, with a $75 million initiative to instill a culture of philanthropy universitywide, asking students to “do good” from freshman orientation to long after graduation. University leaders announced Thursday that they would create an institute, add three endowed professorships and build a new public policy building where the Do Good Institute will be based, using a combination of sources including private donations, state funding and university finances. Lots of colleges are urging their students to give back — at UCLA, to take just one example, more than 7,000 students descended on Los Angeles earlier this week, painting elementary-school classrooms, fixing basketball nets, handing out toothbrushes, reading to children, preparing food for homeless people, cleaning trash off beaches. It’s an idea that appeals to many young people. The Higher Education Research Institute last year reported a 50-year high in the percentage of first-year college students who said that helping others was an essential or very important goal and record numbers saying that becoming a community leader was an essential or very important goal. U-Md.’s initiative grew out of a project five years ago to teach students philanthropy, including a class in which students evaluated how best to use (actual) cash grants to make an impact and a contest for students competing to get funding for an idea. The project that won that year started with a handful of students gathering up food from dining halls on campus that would be thrown out, and delivering it to shelters. Now the Food Recovery Network operates on 191 campuses, said Robert Grimm, director of the Do Good Institute at U-Md., has recovered more than 1.4 million pounds of food and is working to minimize food waste, too. The nonprofit’s goal is nothing less than to be on all 5,000 or so college campuses in the country, and eliminate hunger, he said. The class now has hundreds of students, and the Do Good Challenge attracts more than 1,000 contestants. One group of students sold late-night grilled cheese sandwiches for $2, the amount they needed for each brick to build a new school in Honduras. Another worked through the logistics of hosting a race on campus to raise money for dental care. 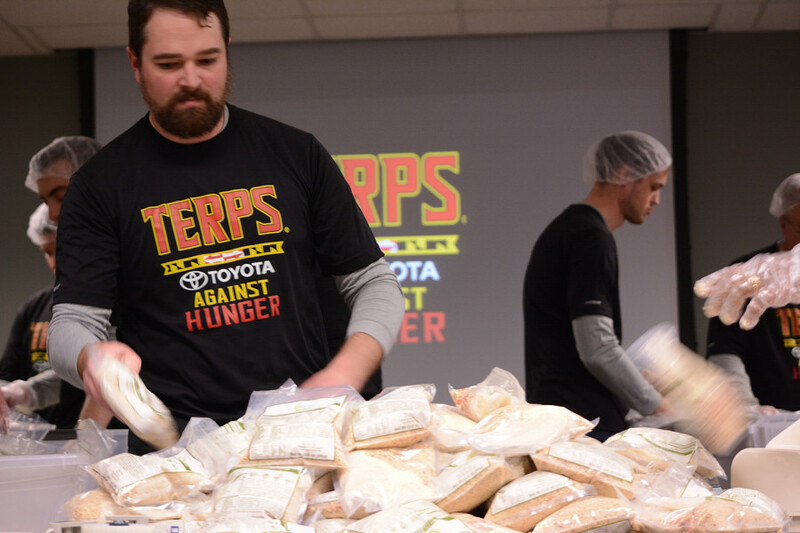 The 2016 winner, Terps Against Hunger, will package meals on campus Sunday, marking their millionth meal. The new initiative builds on that momentum, Grimm said. “Doing good is a core part of what we are as a university,” he said. He hopes students from every major will graduate ready to have an impact on a cause they care deeply about. Having an impact requires a lot more than good intentions, Loh said; people need skills to pull it off successfully, so the university teaches things such as fundraising and marketing and offer support through a new accelerator program. “Some people will say, ‘This is a research university — we’re about research and scholarship — what’s this about doing good?’” Loh said. “We’re not replacing one mission with another. 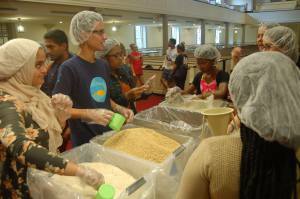 Terps Against Hunger, an organization that has grown substantially over the last three years, put together a meal packing event for the less fortunate in the Metro D.C. area Tuesday in the Memorial Chapel. Turskey first got involved in major service his freshman year of high school, when he started a non-profit called Every 5 Seconds, referencing how often children were dying of hunger. Last year he won the Do Good challenge, which required pitching an idea to a board before carrying it out. Turskey now serves as the TAH president. Turskey began the evening by giving a short speech in the back of the chapel, before the group put on clear hair nets and gathered around where the altar would be. Turskey then spoke to the group again and explained how to fill, seal and pack a meal. There were roughly six groups of 12 to 20 working to package meals. When the work began, it was fast and effective. Each person received one task to complete over and over while popular songs played in the background. Turskey encouraged shouting out of both celebration and necessity. It was not long before shouts of “Rice!” and “Soy!” could be heard over the loud music. The food packed into the meals is not the average lunch. According to Turskey, processed foods can actually be more unhealthy for the hungry, so the ingredients packed are like rice: universal. “Once I got here I discovered so much about the University I didn’t know,” said Melva Coles, an American Studies graduate student. Coles works as an event sales and office assistant at Memorial Chapel, and has worked with TAH for two years. She said she did not know about the organization until she had the position at the Chapel and joined the United Campus Ministry. “It is hugely important to give back,” said Xavier Daschner, a freshman engineering major, “And honestly these events are fun.” Daschner was one of the many people scooping one of the four ingredients and pouring it into a funnel. The event was loud, not just from the music, but from the roar of conversation. That roar will be louder come Sunday when Terps Against Hunger moves to a new location. “This year we’ll be doing 400 thousand meals in the Xfinity Center,” said Turskey. As part of a Homecoming event, more than two thousand volunteers will be present helping to pack meals, according to Turskey. When Turskey first joined Terps Against Hunger his freshman year, he said there were only four members. Nearly 200 Terps discovered that Sunday brunch is more satisfying when you’re feeding other people instead. The University of Maryland Alumni Association teamed up with the student group Terps Against Hunger on July 17 to pack almost 42,000 high-nutrition meals for distribution by the Capital Area Food Bank. Alumni and their children and UMD students stood side by side in the Samuel Riggs IV Alumni Center to scoop and measure out 12,000 pounds of rice, soy, dehydrated vegetables and vitamin powder, then weigh, vacuum-seal and box them. Jonathan Fix ’16, founder of Terps Against Hunger, said the group is excited to expand beyond its volunteer base of students to include alumni families. “It’s really special having children and their parents share the experience—it makes it more enriching for the children as well,” he said. The Alumni Association gave awards to the regional and special-interest networks that brought the most volunteers, packed the most meals and raised the most money for the nonprofit. 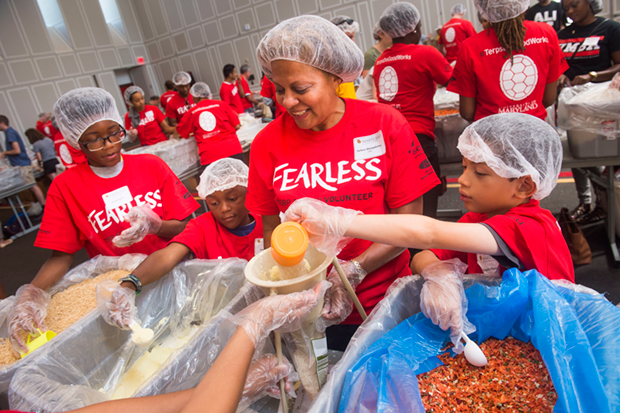 The event will be repeated on a grander scale on Sept. 25 during Homecoming Week, when Fix hopes 3,500 Terps volunteer to pack a half-million meals. Part carnival. Part expo. All fun. It’s Maryland Day, which happens tomorrow at the University of Maryland’s campus in College Park. Along with games, activities and entertainment, Maryland Day features information about a variety of student-run organizations at the university. And Terps Against Hunger, fresh off of its win in Maryland’s annual Do Good Challenge, is looking to make another big splash at the event tomorrow. To do that, Turskey and other student volunteers will operate three different tables within their station during Maryland Day. One will have educational materials on Terps Against Hunger, for those who want to support or get involved with the organization. Another will serve as a packing station for preparing healthy meals for families in need. And a third will educate attendees on the problem of hunger in the local community and beyond. Turskey is deeply committed to fighting hunger insecurity. His interest in the cause extends back to when he was high school in Sykesville, Md. He started a not-for-profit to address this problem while he was still in high school. But when Turskey came to College Park, he wasn’t aware of Terps Against Hunger, nor was he actively seeking to join any such organization. Like many new college students, his mind was on getting settled in his new surroundings. However, during his first few weeks, he saw a familiar sight while strolling through a book fair on campus: a food packet on display. That’s how he found out about Terps Against Hunger, and he got involved with the group soon after that. Now, Turskey spends about 20-25 hours a week on variety of tasks for the organization, ranging from food-packing events to service trips to Baltimore and Washington, D.C., where he and fellow students personally prepare and serve meals to those in need. “We want to connect with the people we serve so we can serve them better,” he said. It’s a big commitment on top of his studies — one that will likely grow as 2016 progresses. Terps Against Hunger is on track to pack more than a million meals this year. And, about one week after Maryland Day, Turskey will assume his new role as president of the organization. Additionally, he plans to get more involved with the Washington, D.C., chapter of its parent organization, Kids Against Hunger. University of Maryland student and Terps Against Hunger volunteer Sarah Barreca wanted to make a difference. When she asked her father Keith Barreca, dealer Performance manager for Toyota‘s Central Atlantic Region for advice, the pair did not anticipate Toyota would respond in a such big way. After Keith approached Toyota General Manager Tim Bliss and Assistant General Manager Bob Zeinstra, a partnership between Toyota and the Terps was formed to deliver thousands of meals in a food-packing event on April 11 at the regional Toyota office on Baymeadow Drive. Toyota’s Central Atlantic Region office purchased the necessary goods, including rice, soy, dehydrated vegetables and vitamin and mineral powders. Sixty of the office’s 75 employees participated. The original goal was 45,000 meals, but the end result was 74,000. Meals were packed and loaded onto Toyota Tundra pickup trucks for a caravan delivery to the Maryland Food Bank. Terps Against Hunger President and University of Maryland senior Jonathan Fix told volunteers they packed at an incredible rate. Maryland Food Bank CEO Beth Martino expressed her gratitude for the generosity of Toyota and Terps Against Hunger. Martino said the meals would go a long way toward feeding hungry households in Maryland, and assured the groups the meals would fly off the shelves.